What is it about the North East of England that keeps throwing out blues biased talent? I mean, we have Eric Burdon and Mark Knopfler from the Tyne end, and Paul Rodgers and Micky Moody from the Tees end, to name but few. (I purposely left out the Brylcreemed passenger ship and the honey-making insect!). The middle river, the Wear has George Shovlin and The Radars and me! OK, I was a bass player in a hard rock cover band that played the N.E. workingmen’s club circuit and never got past the heady heights of Fishburn, Tudhoe, Houghall and the like, whereas with Shovlin we have a Sunderland based blues band who have been making a splash at major UK festivals. The band had been gigging for some time with the same line-up (known then as the George Shovlin Blues Band) from 1995 to 2005 before they took a break. 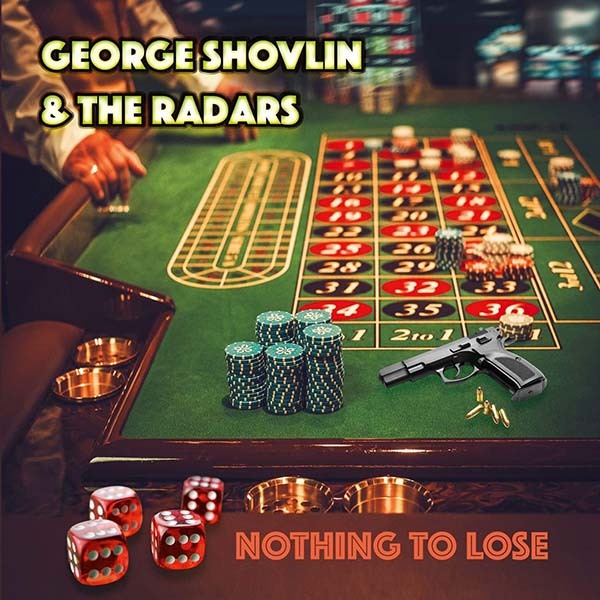 In 2014, they re-formed as George Shovlin and The Radars and set about establishing themselves again in both the local and national scenes. For their fourth album, Nothing To Lose, the band has put together 11 original compositions that should bring them to the attention of a wider and even international audience. The opening track, Don’t You Just Love The Blues, has a classic piano rolling background with stabbing guitar adding colour, while Shovlin tells of the blues artists and the US cities that inspire and influence their playing styles. The bass line is very subtle and as essential as the lovely solos which expand the sound. Disappointingly, however, the best solo is faded out! Got Home This Morning gives an acoustic backing with beautiful electric overlaying a bass and drum combination that immediately puts this firmly into the top drawer of 21st Century blues. Shovlin’s dark vocals suit the song and its subject matter…I want to say gravelly, but that seems overused these days; as is whisk(e)y soaked, so I’ll go with a controlled rawness that doesn’t detract but adds to the sound. The pace increases with Cruisin’ Come Sundown. This comes across a bit disjointed at times, but it holds together courtesy of the solos. William Frederick (A Homage) is their tribute to the inimitable Billy Gibbons and reflects their admiration for the man. It is slower and less Southern Rock than you’d expect but, once again, has such well thought out guitar, it is more than a fitting tribute. This is followed by I Don’t Mind, which has Shovlin pouring so much emotion into the lyrics that you get swept along and feel it with him. The slow tempo works well here and the bass and drums are as integral to this emotional song as the superb guitar. Just Wanna Have A Good Time s much faster as the Hammond introduces the melody and a surprisingly suitable and crafted sax solo from Mick Cantwell. Lord Hear My Prayer has Jim Bullock’s brilliant harp interludes to add depth and variation to the theme. Need An Alibi follows with a rapid-fire bass/drum/guitar combination and piano highlights to give a classic feel to this Juke imbued track. Funky rhythm and bass is the dynamic that carries She’s So Fine with Lamb delivering yet more excellent guitaring. Should Have Left You Baby is also tinged with a background layer of funk, but with the guitar illuminating the end of each line it maintains a classic blues-rock feel. The churning Hammond organ and harmonica on the closing track, You Know Who’s Gonna Win, uses a Chicago pattern in a seemingly traditional way until the ascending chord finish with all instruments synchronised makes it that little bit different and a little bit better for it. In summary, then, this is a strong, true blues album with exemplary musicians. Every track has its strengths and yet, it leaves me thinking that it could have been better because they clearly have the talent to stand out from the crowded blues scene. Don’t get me wrong, it is very good and will feature regularly in my listening, but if they could bring the originality and tingle inducing qualities of my favourite track, Got Home This Morning, and infuse more of their songs with this kind of distinctiveness then their next album will be truly exceptional. Also featuring: Paul Wilson – piano/Hammond; Jim Bullock – harmonica; Mick Cantwell – saxophone. Don’t You Just Love The Blues!